A motorcade protest to protest against the ‘Counter Terrorism Act’ the government intends bringing to suppress civil organizations, farmers’ organizations, students’ movement and trade unions will commence from Colombo Fort tomorrow (1st) at 10.00 a.m. states National Trade Union Center (NTUC). The National Organization of NTUC Wasantha Samarasinghe said the Act. The government intends adopting is one that would be deployed to suppress civil society activists, trade union representatives, student activists and sabotage all struggles for just rights. Already, massive protest movements have been launched to defeat the Act and the NTUC has requested all political parties in Parliament not to allow the Act to be adopted in Parliament. The discussions held between the Maithri faction and the Mahinda faction of the SLFP were not fruitful and the forthcoming election should be contested separately say senior members of the SLFP. They have informed the President of the SLFP President Maithripala Sirisena regarding this say reports. They have told President Sirisena that among the proposal that the two factions agreed during the discussions there were no proposals that would state how the SLFP would act at the next presidential and general elections. They point out it would harm the identity of the party and would pave the way for the destruction of the party. Meanwhile, the discussions President Maithripala Sirisena had with former President Chandrika Kumaratunga, Ms Kumaratunga had said she would support only if the SLFP protects its identity and the party should go forward with Bandaranayke policies. What’s the use of a government if it cannot supply continuous electricity when rain fails for a few weeks? What’s the use of a government if it cannot supply electricity for 24 hours due to the absence of rain for a few weeks asks the General Secretary of the JVP Tilvin Silva. The country has not achieved victories in any sector during the past several decades and at present, all spheres in the country have thoroughly deteriorated he pointed out. 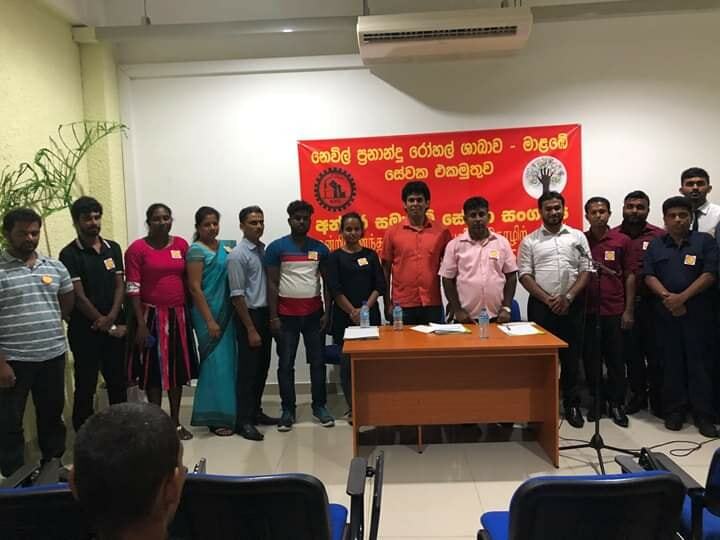 The JVP General Secretary made these observations speaking at an event held to re-organize the JVP Electoral Organization for Ratgama. Speaking further Mr Tilvin Silva said, “What is the purpose of a government if it cannot supply electricity for all 24 hours merely because it doesn’t rain for a few weeks? These parties have ruled the country for 71 years and they have bragged about development. I remember the likes of JR Jayewardene when bringing in Accelerated Mahaweli Development Programme said they would build 6 reservoirs with loans obtained and after supplying electricity to the whole country the excess would be sold to India. That was the dream then. What is the purpose of a government if it cannot continuously supply electricity, which is an essential commodity in a country? Why did so much money spent on those projects? Why did Kerawalapitiya and Norochcholai power stations were built spending millions if a continuous supply of electricity cannot be supplied for the people? A branch of the Inter Company Employees Union (ICEU) has been established at Neville Fernando Hospital at Malabe. The trade union branch was established when employees of the hospital took membership of the ICEU and the administration recognized the ICEU as the trade union of the hospital. The inaugural meeting of the ICEU branch of the hospital was held on the 27th and the President of ICEU Wasantha Samarasinghe too was present. Speaking at the inaugural meeting Mr Wasantha Samarasinghe said ICEU would strive to protect the rights of the employees. During the crisis situation regarding the SAITM private educational institute, Neville Fernando Hospital was taken over by the government and now it is being administered as a semi-government institute. The two main parties should be held responsible for the political instability that has surfaced in the country says the Member of the Political Bureau of the JVP K.D. Lal Kantha. When a country is unstable there is no acceptance to that country from the international community. The rulers from the two main parties who have ruled this country have dragged the country towards instability due to their incompetence and engaging in frauds and corruption in the country. Mr Lal Kantha made these observations addressing the meeting held to re-organize the JVP Electoral Organization at Rakwana. The expenditure heads of Megapolis and Western Development Ministry that come under Minister Champika Ranawaka and several expenditure heads of Internal and Home Affairs and Provincial Councils and Local Government Ministry under Minister Vajira Abeywardane were defeated during the committee stage of the ‘Budget 2019’ yesterday (28th). All expenditure heads of Minister Champika Ranawaka’s Ministry were defeated with 38 MPs voting against and 24 MPs voting in favour. When the vote was called for expenditure head number 260 of Vajira Abeywardena’s Ministry and it was defeated with a majority of 18 votes, with 38 MPs voting against and 20 MPs voting in favour. “During the last five to ten years the foreign diplomatic service has become a place for political chums and only a very few of them are efficient. We have no Ambassador for the USA or a High Commissioner of Australia. Political appointees have been sent to Russia, India, China, Japan, Saudi Arabia, South Korea and all the countries in SAARC region. There hasn’t been an ambassador to Washington for the last year. Have we become so powerful that we don’t care whether we have an ambassador for the US or not? These politicians completely destroyed what was left of the status Sri Lanka enjoyed internationally. One is Udayanga Weeratunga. Jaliya Wickremasuriya was accused of fraud. There are Sri Lankan diplomats who are in the list of red alert. ASP Liyanage was appointed as Ambassador to Qatar. He became a porter carrying bags of Rajapaksa sons. When appointing for diplomatic service appoint only Sri Lankan residents without appointing dual citizens. Sri Lanka needs to overcome the political crisis as well as the economic crisis. Also, it is necessary to eradicate drug menace. For that a strong diplomatic service is essential. We don’t accept the international court. We reject international judges. These are traps. International mediation occurs when justice is not carried out properly in the country. Mr Rathnayake made these observations participating in the committee stage of the budget speech. Underworld leader Kanjipaani Imran who was detained in Dubai has arrived in Sri Lanka today (28th) morning. Kanjipaani Imran alias Mohammed Najeem Imran had been deported from Dubai and when he landed at Katunayaka Aiport he was arrested by the CID for questioning says police spokesman SP Ruwan Gunasekera. He had made arrangements to fly to the Maldives as soon as he arrived at Katunayaka but the CID was able to arrest him before he carried out his plan say police. No decision has been taken to put forward Mr Gotabhaya Rajapaksa as a candidate for the forthcoming presidential election says Kurunegala District Parliamentarian Mahinda Rajapaksa. He said this at a discussion he held with newspaper editors and heads of media institutions yesterday (26th). Mr Mahinda Rajapaksa also said Mr Basil Rajapaksa had already rejected being the candidate for a presidential election and has added that the head of the brothers’ company is Mr Chamal Rajapaksa. He has said at a family gathering held recently there was a discussion regarding the matter but no decision was taken regarding making Mr Gotabhaya Rajapaksa the presidential candidate and Mr Basil Rajapaksa too rejected the proposal. Speaking further Mr Mahinda Rajapaksa had said they were still looking for the candidate who could win the election. It is the politicians who destroy all the resources in the country including the forest reserves says the Leader of the JVP Anura Dissanayaka. He said this addressing a meeting held in Piliyandala area yesterday (25th). Mr Dissanayaka said it is the politicians who illegally mine for sand, maintain quarries as well as build hotels in protected areas. He said the politician in the country has become a criminal who doesn’t have an iota of civility in him. The Leader of the JVP said the JVP will contest future elections only from a broad people’s force that would be built with the mediation of the JVP and he can guarantee that this people’s force would definitely build the country and make it a righteous land where people could live happily.